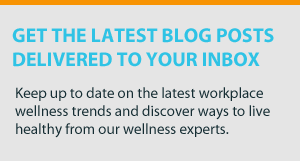 You might have noticed that we’ve brought up “mindful eating” a few times in our latest blog posts about eating healthily. That’s because how you eat is just as important as what you eat! Developing healthy eating habits will help you achieve a nutritious, balanced diet. But what exactly is mindful eating? It may be easier to start by identifying what “mindless eating” is first. Have you ever sat down on the couch to watch some Netflix and then realized you accidentally ate an entire bag of chips in one sitting? That’s mindless eating. It’s a bad habit that a lot of us are guilty of. Mindful eating is the polar opposite. Simply put, it’s the practice of eating with intention and paying attention while eating. It’s not a diet, nor does it require you to restrict certain foods. It’s about learning to pay attention while eating and enjoying the experience of eating. Mindful eating will keep you from overeating, teach you to recognize when you’re full, and make eating more satisfying. Eating slowly is one of the simplest ways to incorporate mindful eating into your routine. Slowing down your pace with help you enjoy the tastes of the food as well as prevent you from overeating. Take small bites. This will help make your meals last longer. Put your fork down between bites. Putting down your silverware in between bites is a great way to make sure you are pacing yourself throughout your meal. Focus on the textures and tastes of your food. Instead of rushing to fill your stomach, try savoring each spoonful of food. Are you actually hungry or are you just bored? Listening to your body will help you distinguish the difference between physical hunger and emotional hunger (eating for comfort, boredom, or therapy). Know your body’s hunger signals. Your body will let you know when it’s time to eat. You may feel sluggish, weak, dizzy, and have a growling stomach. These are the signs of physical hunger. The signs of emotional hunger can range but usually involve feeling stressed, sad, or even just bored. Recognize when you’re full. It actually takes about 20 minutes for your brain to signal to your body that you are full. Give yourself time for the feeling of fullness to settle in before completing clearing your plate. A healthy eating environment is more important than you may think! When your dining area is suitable for a peaceful meal, you will be able to focus on mindful eating. Sit down. Eat your meals at a table! Use proper silverware and make sure you are comfortable and can focus on your food. Give yourself time. Make sure you are relaxed and have enough time to eat your meal without feeling rushed. Avoid eating at your desk. 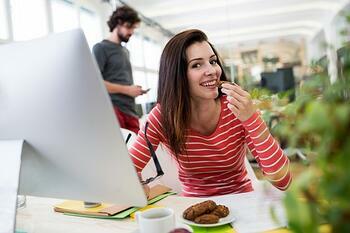 Many of us eat our lunch at our desks during the workday. Always try to take a break while eating your lunch if you can. Eating while working on a project can cause you to mindlessly eat and overeat. Eliminate distractions. This includes turning off the TV, cell phone, and laptop. It’s difficult to eat mindfully while watching Hulu or replying to emails. Pre-portion your food. If you do want to have a snack while watching TV on the couch, pre-portion your food. Taking a full bag of chips to the couch will lead to eating more than you want to. Put any snacks on a small plate or in a small container so that mindless eating won’t take over. Keeping a food journal will help you discover if certain foods trigger any unhealthy eating habits and will help you adopt better eating habits. Track what you eat. Write down what you eat throughout the day. Try to do this after every meal so that you don’t forget what you ate. Write down why. Why did you eat the certain foods that you did? Was it because it tasted good or because it was nutritious and you were hungry? Was it out of convenience or did you cook it yourself? Write down how you felt. How did you feel after eating the food? Did you feel energetic, satisfied, healthy, sluggish, bloated, or guilty? Tracking how you feel after eating certain foods will help you realize how certain foods affect you physically and/or emotionally. Mindful eating is beneficial in many ways when it comes to your health. It could help you lose weight, eat more nutritiously, and reduce any feelings of stress that may come with eating. Try out mindful eating for yourself, and learn to appreciate your food again! Do you practice mindful eating? Leave us a note in the comment section below!